BLACK PEPPER & ROSEMARY | Wax Melt Tart | Phthalate Free | Sassy Kandle Co.
Fragrance: ROSEMARY & BLACK PEPPER - A warm, spicy black peppercorn blend married with the cool and crisp notes of rosemary. Notes of bergamot & oakmoss round out this herbal fragrance. 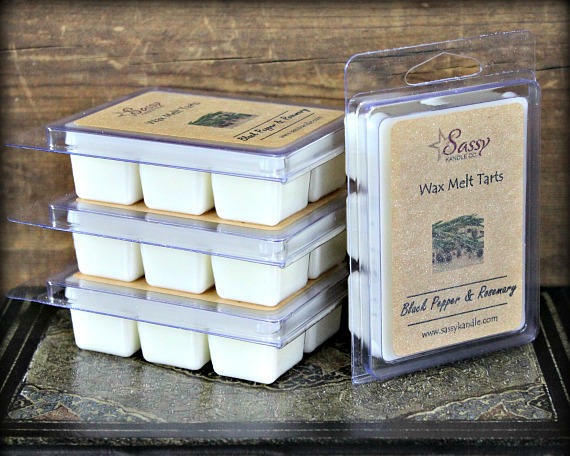 Sassy Kandle Wax Melt Tarts are hand-poured in individual batches, ensuring a quality product every time – no mass produced products here! We use only premium fragrance oils that smell true to life – no fake chemical smell with our products. Wax Melt Tarts are a safe way to enjoy great fragrance – simply break off a chunk or two of wax and add them to your electric or candle warmer. Because the tarts have no flame in direct contact with the wax, the scent will be dispersed quickly and cover a wider area. Each wax chunk will last approx 4-6 hours (total for entire individual Wax Melt Tart is 24-36 hours). Each tart package measures approx 2.75" x 4.25".